Following communication from CAMERA’s Israel office, Haaretz‘s English edition has corrected an editorial which falsely stated that an Israeli bill calls for jailing children as young as 12. Editors have yet to correct, though, a news headline and an Op-Ed by Gideon Levy which make the same false assertion. After two children stabbed a security guard in Jerusalem, a new response emerged that conforms to the philosophy of Justice Minister Ayelet Shaked: reducing the age of criminal accountability and jailing children from age 12 – just as in Eritrea and Morocco. Israel’s Justice Ministry has almost finished drafting a bill that would allow children under 14 to be sentenced to jail. Under the bill, which is the brainchild of Justice Minister Ayelet Shaked, jail sentences could be handed down to children as young as 12, though the offender would start serving the sentence only when he turned 14. Prison sentences could be imposed on children younger than 14 only if they are convicted of murder, attempted murder or manslaughter, the draft bill states. After two children stabbed a security guard in Jerusalem, a new response emerged that conforms to the philosophy of Justice Minister Ayelet Shaked: reducing the age of criminal accountability and jailing children from age 12 (even if the actual imprisonment is deferred for two years) – just as in Eritrea and Morocco. . . . In addition, editors commendably appended a note at the bottom of the online article noting the change. The correction has not yet appeared in the print edition. As of this writing, editors have not yet corrected the prominent, page one, above-the-fold headline, although it has been pointed out to them. 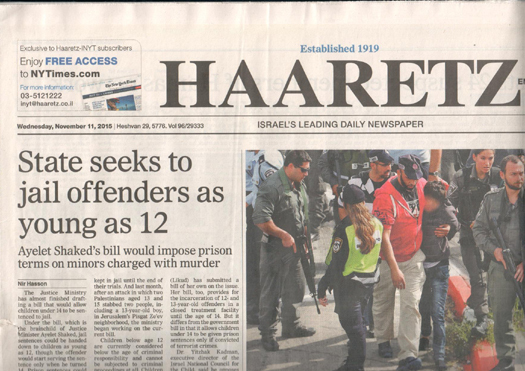 CAMERA continues to call on Haaretz editors to correct the false assertion – wherever it appears, both in print or online, in headlines or in Op-Eds – that the bill (not law) allows for the imprisonment of children as young as 12 . For additional Haaretz corrections prompted by CAMERA and its Hebrew site, Presspectiva, please see here.